Have your groundwater measurement data available! OTT Hydromet has developed an integrated groundwater monitoring and data management solution. The combi-package includes the OTT ecoLog 500, a device for the collection and remote transmission of groundwater data and the Hydromet Cloud, a mobile and web-based software solution for storing and managing measurement data. The groundwater combi-package saves you time-consuming trips to the measuring site because you have access to your data at any time from anywhere. You also save money because the combi-packages are available at a special price. It’s no secret that pairing telemetry with groundwater sensors saves time and resources from having to manually collect readings in the field. However, groundwater telemetry networks can be limited by the availability of transmission coverage in the area of often remote wells. 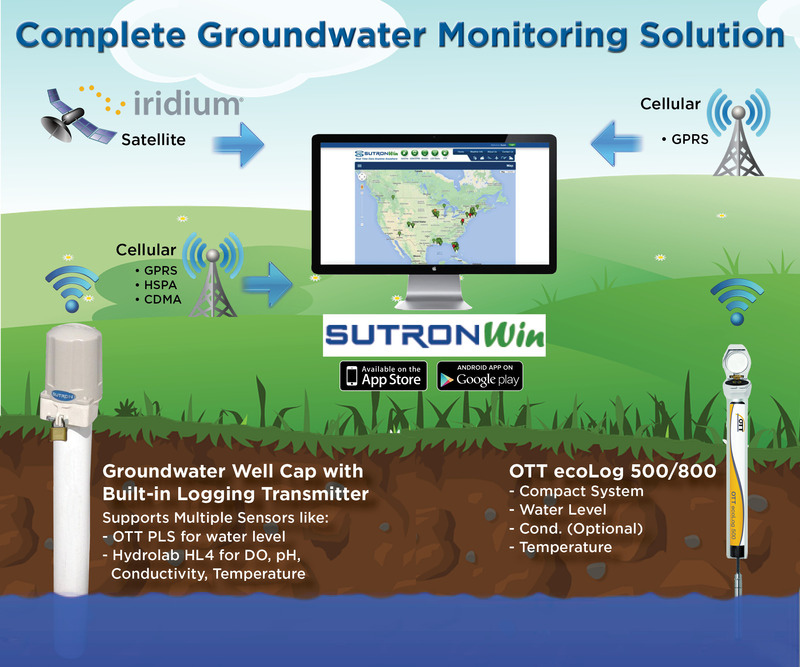 OTT Hydromet and Sutron have combined capabilities to offer extremely flexible and comprehensive telemetry options for transmission of groundwater level and quality data via the OTT ecoLog series and by pairing OTT and Hydrolab sensors with the Sutron Well Cap. Now, you can receive groundwater data via GPRS (like AT&T and T-Mobile), HSPA, and CDMA (like Verizon) cellular protocols as well as the iridium satellite for the most remote locations! Better yet, this data can now be viewed, managed, and analyzed via the SutronWIN data portal and mobile app! From the first drop of rain to freshwater flowing out to sea, OTT Hydromet has a sensor to measure water at every step in the water cycle. Check out the map below to see our products in action! OTT Radar Level Sensor (RLS) Around the World Video! The OTT Radar Level Sensor (RLS) is one of our very popular level sensors and used at thousands of surface water sites around the world! Check out our 2-minute video below highlighting the benefits of the sensor and some interesting global applications. Never miss a post! Receive an e-mail notification any time we add new content.